A kitchen’s not a kitchen if you don’t have a Bamix. With Bamix’s Swissline Superbox, you can take on any kitchen task with the one compact appliance. 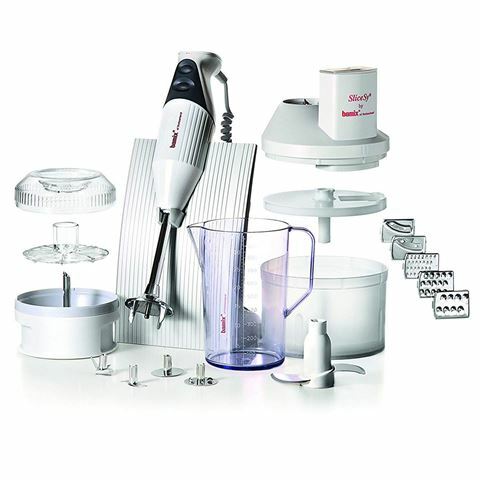 Set in a crisp white tone, this hand blender comes with a variety of stainless steel attachments including a mincer, beater, whisk, meat mincer as well as a compact grinder. It also comes with the SliceSy attachement that transforms your wand blender into a powerful food processer that makes slicing fruits and chopping vegetables child’s play. Crafted from stainless steel and polycarbonate. Two speed settings – 12,000 and 18,000 rpm. Ergonomic grip for right-handed or left-handed use. Can be used directly in a pot on the stove. Comes with various stainless steel attachments including a mincer, beater, whisk, meat mincer and grinder. SliceSy transform your wand mixer into a powerful food processor that chops, slices and grates fruits and vegetables. SliceSy comes with five stainless steel interchangeable blades. Includes a stylish storage stand. Box Dimensions: 39.5cm (l) x 41cm (h) x 16.5cm (w).